Went for the grinder assault on the rear mudguard yesterday, cutting away the bottom left corner to allow clearance for the chainguard. 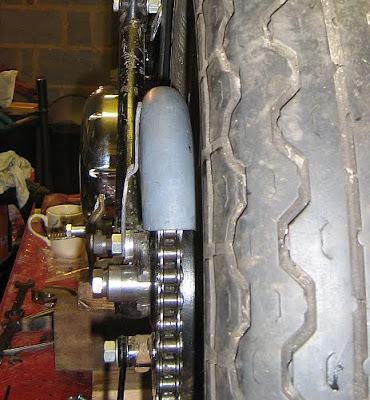 Decided to go with a proper chainguard rather than the ubiquotous bit of bent one inch flat strip, or the other oft seen example of nothing at all. I feel that firstly, legs are for life and not just for Christmas and, accepting that first criteria, then it should be a chainguard of substance and standing. Started by getting the fix on the brackets that were formed last week, to ensure that the final position would be repeatable. 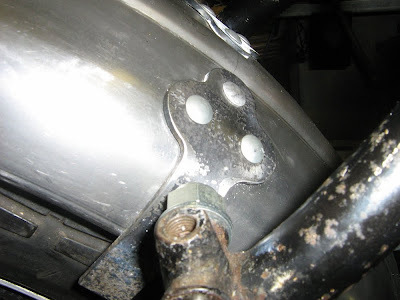 The screws used are a type of cinch bolt, where there is a small star shape section beneath the head that cuts and grips into the metal as the nuts are tightened. They give a really cool look in my opinion, resembling classic rivets but are still able to be undone. In the final outcome, when the mudguard is in colour, and the brackets are black, these are going to look pukka. The next phase for these is to make up the lugs that will be welded to the brackets to pick the standard BSA mounting points. With this done and the mudguard sitting in, what will be, the finished position, the chain guard was offered up and a reference line struck on the mudguard along the top and bottom of the chain guard. This is not the easiest thing to get right as, without any cuts, everything is tight and under pressure in the areas of interest. 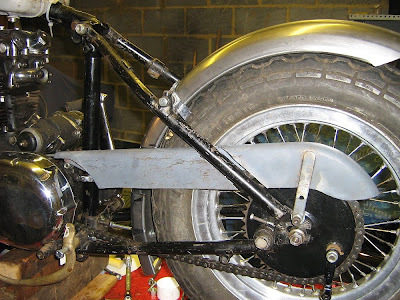 A quick look at the original BSA drawing at the top of the page shows that the width across the frame rails is only 7" and the mudguard is 6" wide, bear this in mind as things progress. Anyway, back to the hunt, with the top and bottom marked the mudguard came back off and a radial line drawn to join the two previous marks. A 1 1/4" hole saw was used in the corners to radius the edges of the cut, and the rest was then removed along the lines with the trusty angle grinder. The mudguard was refitted to check the cut, the picture on the right is a little flattering, and I must confess to not taking a picture of the mudguard when it was off. A second smaller cut was made to accomodate the bottom run of the chain rather than the usual removal of the complete section as is often the case. Being a rigid framed bike there is no suspension movement to accommodate, only a bit of chain whip. This may come back and bite me in the arse, figuratively speaking that is and not the chain 'cos it's guarded, time will tell. It was at this point that it was noticed that the chain guard was being held off center by the upper chain stay, suitable expetives were uttered as it was realised that this would also have to be cut to relieve the interference and allow the chain guard to move further over to the left. All the swearing in the world would not alter the facts and the chainguard was marked out for the cut. This picture shows the chain guard after it's intimate encounter with Mr Makita, it has, in fact, only shifted over 3/8" or so but as soon as it was given room to move everything relaxed. The gap will be filled wit a scallop to put the strength back into the structure. 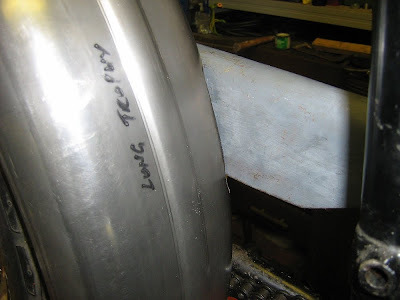 I'm currently looking at the center rib of the discarded mudguard piece to provide the infill. A look at the following picture shows the chain line with the cut and I feel that this on it's own justifies the work. And now the support bracket needs to be addressed.